Los Angeles, CA – Dominique Gallery is pleased to announce STAY FREE, its first solo exhibition with the artist, Hasef. The show will open on October 13, 2018 and will remain on view through November 3, 2018. An opening reception will be held Saturday, October 13 from 6:00pm - 9:00pm. STAY FREE features new work by Hasef including works on paper, canvas, prints, and video art that examine notions around freedom, time, and place. Through text based works on paper, mixed media collage, and moving imagery, Hasef raises the question of how we interpret and manifest freedom and independence. While some of the work focuses more heavily on dismantling preconceived notions, other images call into question our current state of affairs and the next steps that we should take to secure our freedom and future. Hasef is a multi-disciplinary artist from Los Angeles, California. He uses video, photography, sculpture and painting to investigate the African Diaspora, trans-Atlantic memory, and the effects on American social structure through a millennial perspective. Through his international travels, Hasef has also explored ideas about identity and perceptions of freedom in contrasting environments. His work reminds viewers of critical issues that reappear in different ways across generations. Dominique Gallery is located in West Adams, Los Angeles, home to a growing community of artists and art spaces. Launched in 2015 as the Studio Gallery Center, Dominique Gallery has since reopened under a new moniker with a focus on emerging and established artists of color and women. STAY FREE is the second exhibition presented by the new gallery and will include an artist walk-through and closing reception. 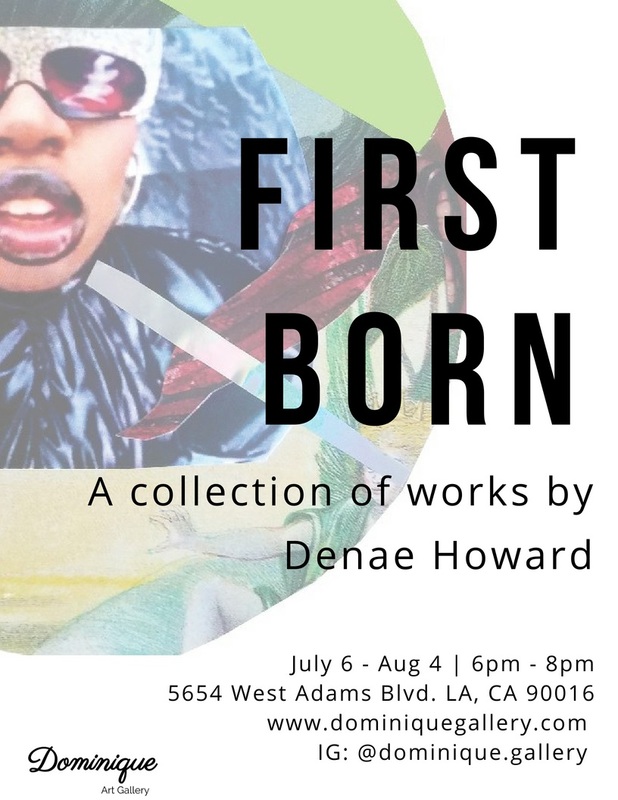 Los Angeles, CA – Dominique Gallery is pleased to announce First Born, it’s first solo exhibition with Denae Howard. The show will open on July 6 and will remain on view through August 4, 2018. An opening reception will be held Friday, July 6 from 6:00pm - 8:00pm. First Born features over a dozen pieces of work including paintings, installation, and an assemblage of mixed media collages that examine reflections on the interwoven glory and hardship attributed to black female bodies. During the last 5 years, Brooklyn born artist, Denae Howard has produced a remarkable body of work incorporating family, race, humor, conflict, and social commentary. Among the notable works on view in the show is a piece entitled Fate Sisters, consisting of a portrait of the artist and her siblings as children layered with an intricate text diagram outlining the literal deconstruction of black female body stereotypes. This theme carries into other selections in the show which include a mixed media mobile collage and works on paper. Howard uses an interdisciplinary practice with a focus on printmaking and digital art to create different genres of work interconnected through themes and messaging. Her work serves as a coded-guide that promotes discussion and deeper thought around the similarities and differences in the way individuals experience current systems in place. Howard’s work has shown in galleries and festivals in New York and California and she is a recent graduate of the CalArts MFA program. Dominique Gallery is located in the West Adams, Los Angeles, home to a growing community of artists and art spaces. Launched in 2015 as the Studio Gallery Center, Dominique Gallery has since reopened under a new moniker with a focus on emerging and established artists of color and women. On July 6, 2018, DOMINIQUE GALLERY will open its doors to the public with a solo show featuring the work of Denae Howard. We are excited to be reopening the space formerly known as Studio Gallery Center founded in 2015. This will be the first of many shows featuring the work of emerging and established artists and we are happy to contribute to the growing arts presence along West Adams Blvd. Please join our mailing list and follow our social media pages for updates on upcoming shows and events.